with Grandmom, Cassie and Zac, who rode first. 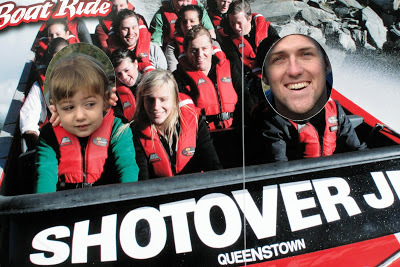 Queenstown is all about adventure. 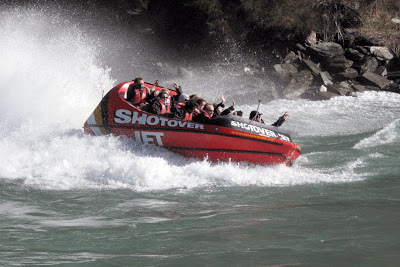 So, after bungy jumping, we rode in a jet boat. I mean, seriously, a jet boat, the name itself is intriguing enough, especially for someone like me who loves being on the water. Basically, it’s like an over-sized jet ski that has seats for 14 people, including a professional driver. The boat goes fast [I believe our driver said we were reaching 70 kph, which is like 45 mph.] 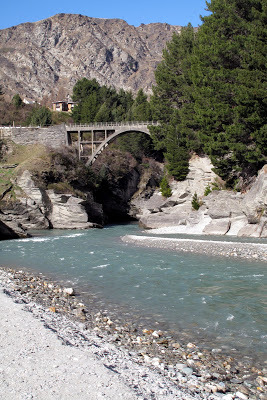 on top of shallow water and can make quick 360-degree turns while riding close to rocks in the river canyon. Like a roller coaster on water, the ride was fun. Plus the scenery was beautiful. Cate looks like she’s trying to ask Zac what they’re doing. I’m pretty sure he’s thinking, just smile, Cassie thought this was a good idea. And I’m glad she encouraged this because it cracks me up!